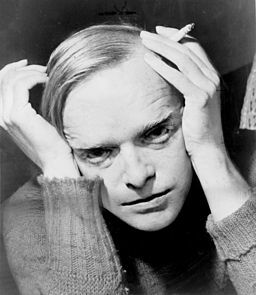 Truman Garcia Capote was born Truman Streckfus Persons on September 30, 1924 in New Orleans, LA. His parents divorced when he was young and he spent his childhood with various relatives in small towns in Louisiana and Alabama. His mother remarried, Joseph Garcia Capote and he took his step-father's name. He attended private schools and eventually joined his mother and step-father in Millbrook, Connecticut, completing his secondary education there. In 1945, having given up further education, he achieved early literary recognition when his haunting short story, "Miriam", was published in Mademoiselle Magazine. Capote's earliest published novel, Other Voices, Other Rooms, came out in 1948 and was acclaimed as the work of a young writer with great promise. The first of Capote's most popular works, Breakfast at Tiffany's, was originally published in Esquire Magazine in 1958 and then as a book with several other stories. The second of Capote's most notable works was the true crime masterpiece, In Cold Blood. This was his chilling nonfiction account of the murders of four members of the Clutter family in Kansas in 1959. He spent six years researching the murders and interviewing the accused murderers. Its critical and popular success proved to be the high point of his dual careers as a writer and celebrity socialite. After this accomplishment, none of Capote's later writings were quite as successful as his earlier works. Truman Capote died in Bel Air, Los Angeles on August 25, 1984 at the age of 59. Books like Truman Capote's "In Cold Blood"
If you like Truman Capote's true crime masterpiece, "In Cold Blood", you will like these books.